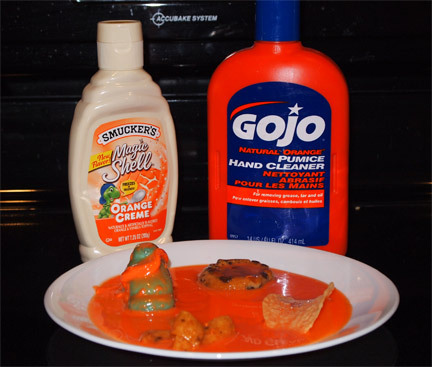 On Second Scoop: Ice Cream Reviews: Smucker's Orange Creme Magic Shell or is that Gojo hand cleaner? or is that Gojo hand cleaner? Ok, that's either Smucker's Orange Creme Magic Shell or the very handy Gojo Natural Orange Pumice Hand cleaner poured on top of a blue marshmallow peep, a chips ahoy cookie, a pringle, and some fritos. Oh, alright, it's the Smuckers.... more specifically, it's the liquidy part of the semi-condensed magic shell. The bottle has long since expired and become something entirely.... messy. The goopy part was stuck to the bottom of the container. I did enventually get some of solid stuff out - you can see the peep wearing it. The orange creme flavor was new for 2011 and I felt obligated to pick some up and try it since it was only two bucks a bottle. Problem is (or was), that I never had an urge to try it. It just sat and sat and sat in the cabinet. I know some people love those chocolate oranges, but for me, I drink my OJ for breakfast and save my chocolate for... well, for after breakfast really. So two bucks down the drain, but at least I had a little fun with it. That is really unappetizing! Other than carrots it would be hard for me to eat orange food.